Do you need works boots that will last year in and year out? Do you need to stop throwing money away on department store footwear that falls apart with the first signs of wear? We have the answer you need. The Chippewa Men's 26330 USA-Made 8 Inch Steel Toe Insulate ... (see full details) (see specifications) #CHP26330. Do you need works boots that will last year in and year out? Do you need to stop throwing money away on department store footwear that falls apart with the first signs of wear? We have the answer you need. The Chippewa Men's 26330 USA-Made 8 Inch Steel Toe Insulated Waterproof Brown Boots are made to last with heavy-duty construction and durability included. These Goodyear leather Welt constructed boots have high performance Vibram Cascade yellow plug outsoles made to last even during rugged wearing conditions. This type of construction stitches the rugged outsoles to the strong leather uppers, giving you reliable Chippewa boots. Heavy duty wax sta-tied laces, antique brass non-tarnishable hardware - double riveted lace locks and non-tarnishable single rivet D-rings - prove that these USA-made boots will last longer than those other, and they'll last for a long time. With all this heavyweight construction, you may be expecting some stiff ole men's boots that barely move with your feet and feels like a lead weight. That's not so with these. The waterproof boots are also the measure of comfort with cushioned collars to give added ankle support. The American-made boots are waterproof with Ruby Dri-Lex 2000 lining to keep your feet dry and warm in every environment. Chip-A-Tex waterproof booties locks water out while allowing air to still pass through, giving your feet a breathable place to be. Even the soft insoles are TEXON 460 waterproof footbeds. And with the non-marking, oil- and slip-resistant soles plus steel toe protection and electrical hazard certification, we have you covered. Not only are your feet protected in the steel toe boots, but they'll also be kept warm. There's 400 grams of 3M Thinsulate Ultra insulation just waiting to surround your hardworking feet. 4 iron rubber midsoles and triple-ribbed steel shanks will give you support while you're hard at work. So when you get fed up with other men's footwear, come try the Chippewa Men's 26330 Waterproof 8 Inch Brown Steel Toe Boots. Order yours from Working Person's Store today! We feel sure you won't go back to your old ways. If you're looking for a insulated waterproof but don't need the protection of a safety toe, take a look at the soft-toe version of this work boot the Chippewa 29416. I work in the logging field and absolutely love these Chippewa boots. I have 5 types of Chippewa Boots and love everyone of them. The Waterproof insulated boots are great in the winter, my feet stay dry and warm and are comfortable all day long. Another plus is the shoe strings they stay tied all day long. These boots are one of a kind and Chippewa boots are one of the top boots in my book! MADE IN THE UNITED STATED OF AMERICA !! This boot has done me well! Climbing and working off of ladders, I walk on 3/4 inch gravel all day long. The shank and ankle support are great on this boot. Can not put a price on comfort! This is one of the longer lasting boots that I have Owned. I am on my 5th pair. More of a winter boot as it is insulated is the only set back I have. One of the more expensive boots but worth it! And supporting our American Workers!!! I have been Buying Chippewa Boots for the past 10 years, Hands down the best on the Market. I work outside in the elements Summer, Winter, Spring and Fall. Never had an issue with cold or heat. My feet always feel comfortable. Great American made boots. These boots keep your feet warm and dry. I work in the extreme outdoor elements everyday. I would recommend these boots to anyone who wants a real great fitting made work boot. 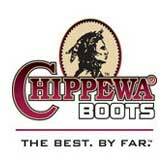 In my opinion there is only brand of boots and that's CHIPPEWA! I've owned over 15 pairs of American made chips and never had an issue with any of them. And how could you pass up the savings working person gives you on these work boots! I am very, very happy with my boots. Thank you for your timely shipment and excellent price. Time to go to the mountains and hike. Chippewa Boots: Men's Steel Toe Waterproof 26330 EH USA-Made Insulated Boots is being added to your cart.